The combination of partial nitritation (PN) and anaerobic ammonium oxidation (anammox) has been proposed as an ideal process for nitrogen removal from source-separated urine, while the high organic matters in urine cause instability of single-stage PN-anammox process. This study aims to remove the organic matters and partially nitrify the nitrogen in urine, producing an ammonium/nitrite solution suitable for anammox. The organic matters in stored urine were used as the electron donors to achieve 40% total nitrogen removal in nitritation-denitrification process in a sequencing batch reactor (SBR). Granular aggregates were observed and high mixed liquor suspended solids (9.5 g/L) were maintained in the SBR. Around 70–75% ammonium was oxidized to nitrite under the volumetric loading rates of 3.23 kg chemical oxygen demand (COD)/(m3 d) and 1.86 kg N/(m3 d), respectively. The SBR produced an ammonium/nitrite solution free of biodegradable organic matters, with a NO2 −–N:NH4 +–N of 1.24 ± 0.13. 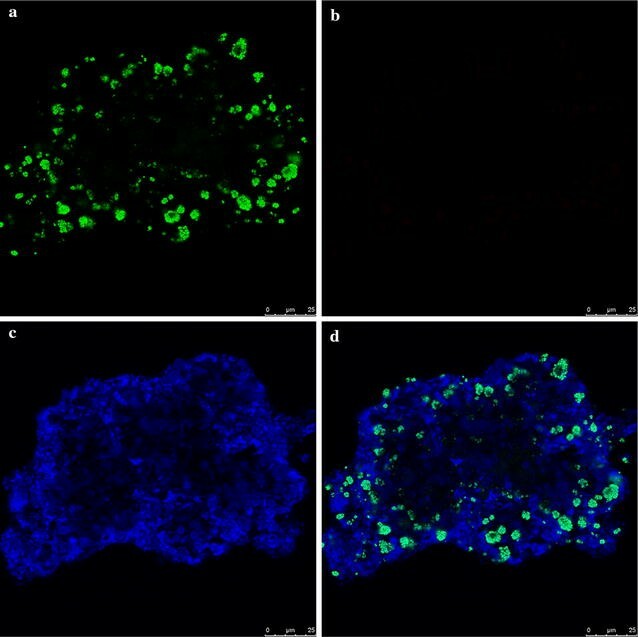 Fluorescence in situ hybridization images showed that Nitrosomonas-like ammonium-oxidizing bacteria, accounting for 7.2% of total bacteria, located in the outer layer (25 μm), while heterotrophs distributed homogeneously throughout the granular aggregates. High concentrations of free ammonia and nitrous acids in the reactor severely inhibited the growth of nitrite-oxidizing bacteria, resulting in their absence in the granular sludge. The microbial diversity analysis indicated Proteobacteria was the predominant phylum, in which Pseudomonas was the most abundant genus. Source separation and treatment of human urine have attracted extensive interest in urban water management since urine constitutes at least 50% of total phosphorus (P) load and 80% of total nitrogen (N) load in municipal wastewater, but represents less than 1% of total volume (Hanæus et al. 1997; Maurer et al. 2006). Urine contains high concentration of nitrogen, up to 8000 mg-N/L, mainly in the form of urea, which is spontaneously hydrolyzed into ammonia nitrogen and bicarbonate, concurrently elevating the pH values over 9 (Udert et al. 2003). Owing to the high content of nutrients in source-separated urine, decentralized treatment could provide an opportunity for efficient nutrient removal options. The combination of partial nitritation (PN) and anaerobic ammonium oxidation (anammox) has recently been regarded as a promising and energy efficient approach to remove the nitrogen compounds in high strength wastewaters (Kartal et al. 2010). In the PN process, half NH4 + is oxidized into nitrite (NO2 −) by autotrophic ammonium-oxidizing bacteria (AOB) under the aerobic environment. In the subsequent anammox process, the remaining NH4 + is oxidized by NO2 − to di-nitrogen gas (N2) under the anaerobic conditions. The PN-anammox process can be established in a single reactor (single-stage) or two separated reactors (two-stage). In comparison to the conventional nitrification and denitrification, the combined PN-anammox process could save 63% oxygen requirement, and eliminate the addition of external organic carbon (Strous et al. 1998). PN-anammox process has also been proposed for nitrogen removal from urine (Wilsenach et al. 2007; Burgmann et al. 2011). From the viewpoint of microbial composition, well-tuned bacterial communities consisting of AOB and anammox bacteria (AMX) are required to achieve stable operation of PN-anammox. The amount of nitrite-oxidizing bacteria (NOB) should be low to prevent the oxidization of nitrite to nitrate. Since the growth rates of AOB and AMX are far less than heterotrophic bacteria (HET), precise control of the growth of HET, which compete with AOB for oxygen and with AMX for nitrite, is of crucial importance. As a result, the influence of organic loading rates, or the chemical oxygen demand to nitrogen ratio (COD/N) in PN-anammox process has been investigated by many researchers. Complete inhibition of AOB under high COD conditions has been well observed by previous studies (Gomez et al. 2000). Chamchoi et al. (2008) reported that AMX were outcompeted by HET in an anoxic system when the COD/N ratio was higher than 2.0 g-COD/g-N. Udert and colleagues reported that high COD/N ratios (up to 1.4–1.5 g-COD/g-N) led to instability in PN-anammox systems treating synthetic wastewater and diluted urine, and the abundance and activity of AMX were negatively affected by the elevated organic loading rates (Udert et al. 2008; Burgmann et al. 2011; Jenni et al. 2014). So far, one-stage PN-anammox systems have mainly been operated with influent COD/N ratios below 0.5 g-COD/g-N. The feasible solution for high COD wastewater seems to reduce the nitrogen elimination rate, for instance 0.27 kg N/(m3 d) in Jenni et al. (2014). Source-separated urine contains high amounts of organic compounds (COD can be as high as 10 g/L, Udert et al. 2006) which implies two-stage PN-anammox be preferred. To apply anammox process in urine nitrogen removal, the biodegradable organic matters in urine should be effectively removed in the first PN stage to eliminate the adverse impacts on AMX. At the same time, the ammonium in the wastewater is partially oxidized to nitrite, and an effluent suitable for the second-stage anammox process is produced. If the organic matter could be utilized for nitrite reduction prior to anammox process, the overall nitrogen loads would be reduced as well. Consequently, the objectives of this study were to: (1) investigate the effect of organic matters in urine on nitrogen removal; (2) produce an effluent with a suitable composition for anammox process and develop a treatment approach for decentralized N removal from stored urine. Undiluted urine samples were collected in a barrel from a male toilet in a teaching building in Beijing Jiaotong University. The urine was harvested daily and stored in sealed containers (20 L) at room temperature for more than 2 months to achieve a fully hydrolyzed urine with a stable ammonium concentration. Prior to organic removal and PN, the P in stored urine was recovered by precipitation with a brine from reverse osmosis (RO) process as a precipitant (Tian et al. 2016). As described in Additional file 1, urine and RO brine were mixed at a volumetric ratio of 1:1 in a precipitation reactor, the effluent from which was fed to a laboratory-scale sequencing batch reactor (SBR) for both organic matter removal and PN. The main water quality of precipitation reactor effluent is listed in Table 1. Since real urine samples were used in the study, the wastewater quality varied in a considerably wide range. The SBR made of a plexiglass cylinder (15 cm inner diameter) has an effective volume of 3.6 L. The reactor was started with suspended biomass from an activated sludge process treating municipal wastewater (Gaobeidian WWTP, Beijing, China). The initial concentration of volatile suspended solids (VSS) in the SBR was ~4.0 g/L. Each cycle of the SBR operation is 12 h, consisting of a feeding phase with stirring (30 min), an anoxic phase (3 h and 30 min), an aerobic phase (7 h), a settling phase (30 min), and effluent withdrawal (30 min). The effluent was withdrawn at a constant depth of 7 cm below the initial water level. The air flow rate in the aerobic phase was maintained at 8 L/min. The solid retention time (SRT) was maintained at 20 days by wasting 5% of the mixed liquor at the aerobic phase every day. The hydraulic retention time (HRT) was kept constant at 1.5 days, and the exchanged volume per cycle is 1.2 L, i.e. 1/3 of the liquid volume in the reactor. The dissolved oxygen (DO) and pH were measured but not controlled. There was a start-up period of three weeks before the commencement of regular water quality analysis (day 0), during which the reactor was fed with 4 times (×1/4) diluted wastewater (Table 1). During the first 42 days of the experiment, the SBR was fed with 4 times diluted effluent from the aforementioned precipitation reactor, then the dilution was reduced to 2 times (×1/2) in the subsequent 26 days. From 69 day onwards, the influent SBR was the precipitation reactor effluent without dilution. An anti-foam agent (Kebio RT500, Beijing, China), as suggested by (Tuantet et al. 2014), was added into the influent (0.025%, v/v) to prevent excessive foams in the aerobic phase. During the experiment, granular sludge appeared in SBR. Particle size distribution analysis of granular sludge collected on day 130 was performed on a mastersizer (Mastersizer 2000, Malvern Instruments Ltd, Malvern, UK). According to the Mastersizer’s instruction, activated sludge samples were dispersed in water in the Hydro 2000s module until a laser obscuration of 10–15% was established prior to the measurement. Each sample was analyzed in triplicate. Fluorescence in situ hybridization (FISH) technique was employed to characterize the nitrifying bacteria of the granular sludge. Granules were fixed in 4% (w/v) paraformaldehyde in phosphate-buffered saline (PBS; 10 mM sodium phosphate buffer, 130 mM sodium chloride; pH 7.2) at 4 °C for 3 h, washed three times with PBS, and embedded in Tissue-Tek OCT compound (Sakura Finetek, Torrance, CA) at 30 °C overnight. Sections measuring 10–20 μm in thickness were prepared using a cryostat (Reichert Jung Cryocut 1800, Leica, Bensheim, Germany). FISH was performed with a EUBmix (EUB338, EUB338-II, EUB338-III) primer specific for the members of the domain Bacteria, NSO1225 specific for all ammonia-oxidizing β-proteobacteria, and NIT3, Nstpa662, Ntcoc206 and Ntspn693 specific for Nitrobacter, Nitrospira, Nitrococcus and Nitrospina, respectively. The 16S rRNA-targeted oligonucleotide probes used in this study are listed in Additional file 1: Table S1. Hybridized samples were observed using a LSM510 confocal laser-scanning microscope (CLSM, Carl Zeiss, Oberkochen, Germany) equipped with an Ar ion laser (488 nm) and He–Ne laser (543 nm). To reveal the microbial diversity of granular sludge, biomass samples for high-throughput sequencing analysis were harvested on day 133. DNA of biomass samples were extracted using the E.Z.N.A. soil DNA kits (Omega, USA) following the manufacturer’s instructions and then pooled together for further molecular analysis. The bacterial 16S rRNA gene was amplified with 338F and 806R primers (Xing et al. 2016). Amplicons were purified and sequenced on an Illumina Miseq platform at Majorbio Bio-pharm Technology Co. Ltd., Shanghai. After quality filtration, 27,510–34,693 effective reads were obtained for each sample. Illumina sequencing data were archived at NCBI Sequence Read Archive under accession number SRR2167764. COD and TN were measured photometrically with vial tests (Hach Lange, Shanghai, China). NH4 +–N, NO2 −–N and NO3 −–N, TP, mixed liquor suspended solids (MLSS), sludge volume index (SVI) were measured according to standard methods (APHA 2005). Because nitrite exerts a COD of 1.1 g-COD/g-NO2 −–N, the COD values were corrected accordingly. In the present study, the feed to SBR was the effluent from a precipitation reactor, in which undiluted source-separated urine and RO brine were mixed at a volumetric ration of 1:1. The TP concentrations in effluent of precipitation reactor varied in the range of 11.5–25.3 mg/L (Additional file 1: Figure S1). Precipitation reactor effluent also contained high concentration of organic carbon (COD of 2200–4800 mg/L) and the COD/N ratio varied from 1.05 to 1.85 (Fig. 1). To acclimate the biomass in the SBR reactor, the strength of influent was elevated from 4 times, then 2 times diluted urine, and finally to undiluted urine, thus the COD and nitrogen loads increased stepwise up to 3.23 kg COD/(m3 d) and 1.86 kg N/(m3 d), respectively. As shown in Fig. 1, during the first 42 days, i.e. the SBR fed with 4× diluted urine, the influent COD was kept around 700 mg/L, and the removal efficiencies attained 80–90%. Further increases and the fluctuations in influent COD hardly changed the removal efficiencies, and the effluent COD values of 200–400 mg/L were maintained throughout the experiment. In the stored urine, ammonium nitrogen constitutes more than 85% of the total nitrogen. 63 ± 8% of NH4 +–N removal was achieved during the startup period of the SBR operation, while the removal efficiency was further improved to 75 ± 3% when the undiluted urine was fed into the reactor. The partial nitrification process led to the decrease of pH value from 9.0 ± 0.2 to 6.8 ± 0.3 (Fig. 2), and the extent of nitritation was limited by the alkalinity of the urine solution, which was reduced from 7 to 10 g-CaCO3/L down to 300–500 mg-CaCO3/L. Nitrite was the major oxidized species of nitrogen, while nitrate concentration was rarely detected and its concentration was less than 2 mg/L. The average concentrations of NH4 +–N and NO2 −–N in the effluent of SBR treating undiluted urine were 682 ± 121 and 815 ± 105 mg/L, respectively, resulting in a NO2 −–N:NH4 +–N of 1.24 ± 0.13 (Fig. 3). The configuration of anoxic-aerobic conditions in SBR resulted in around 40% of nitrogen removal efficiencies under the steady state operations (Fig. 1). The reduction of TN occurred in the anoxic conditions, in which the nitrite produced in the previous cycle was denitrified with the influent organic matters as the carbon sources (Fig. 2). Although very low dissolved oxygen concentration (<0.3 mg/L) prevailed in the aerobic condition, no significant simultaneous nitrification and denitrification was observed. The organic carbon for nitrogen removal via nitrite, or so-called short-cut nitrification–denitrification, in the SBR was maintained at 2.57 mg-COD/mg-N removed (Fig. 3). The biomass content measured by MLSS increased gradually from around 4000 to 10,000 mg/L, while the settleability of the sludge, in terms of SVI, improved from 120 to 48 mL/g (Fig. 4a). During the SBR operation, granular sludge was observed from the around 50 day and became the main microbial aggregates (Fig. 4b inset). The size distribution of the biomass in the reactor indicated there are two peaks on the volumetric percentage profile for these bio-aggregates, approximately at 100 and 1000 μm, respectively (Fig. 4b). FISH–CLSM was used to evaluate the enrichment of AOB and the presence of NOB in the granular sludge performing the partial nitritation–denitritation (Fig. 5). The total bacteria, targeted by probe mix EUB I–III, distributed homogeneously within the granular aggregates. Most AOB (Nitrosomonas-like) clusters, scattered in heterotrophic bacteria, were detected within a depth of approximately 25 μm in the periphery of the aggregate, while NOB were absent in the granular sludge. The abundance of AOB was 7.2% for the granular samples. The 16S rRNA gene clone library analysis was carried out to determine the microbial community composition of the granules formed in the reactor. Among the bacterial populations identified based on the 16S rRNA sequence reads (n = 36,279), the majority belonged to Proteobacteria with relative abundance of 87.6% (Fig. 6). Bacteroidetes was the second phylum in order of abundance, with a value of 6.0%, followed by Firmicutes representing the 5.6% of the total reads. At the genus level, the reads related Pseudomonas accounted for 62.4% of the total reads, other reads relevant to heterotrophic bacteria, such as Burkholderia, Lactobacteria, Rhodobacteria spp. contributed to more than 15% of the total reads. The sequence reads related to Nitrosomonas AOB were identified and accounted for 6.8%. No clones related to NOB and anammox bacteria was observed. Urine contains high contents of organic matters and nitrogen, but their concentrations are not high enough to economically recover these materials. Biological treatment technologies are generally regarded as the best approach to remove biodegradable organic and nitrogen compounds. Due to the low COD/TN ratios, neither conventional nitrification and denitrification nor the nitritation and denitritation appears effective to eliminate the nitrogen compounds in stored urine. PN-anammox could be an ideal option, but the presence of high concentration of organic matters is a challenge. Many previous studies reported that the biodegradable organic matters inhibit the anammox process in single stage PN-anammox in both activated sludge and biofilm reactors (Jenni et al. 2014; Liang et al. 2014; Tomar et al. 2015; Chen et al. 2016). The activity and abundance of anammox bacteria decrease under elevated COD/TN ratio conditions, since heterotrophic bacteria grow far faster than AMX and decreased the SRT of AMX in the reactors (Jenni et al. 2014; Liang et al. 2014). It is suggested to reduce the nitrogen loading rate for single-stage PN-anammox reactor for high COD/TN wastewaters. Therefore, two-stage PN-anammox, i.e. separated reactors for partial nitritation and anammox, respectively, would be preferred for waste-streams containing high concentrations of nitrogen and organics, for instance urine. It is reported that acetate accounts for about 50% of the total COD (Jenni et al. 2014). Since most organic compounds in the stored urine are easily biodegradable, they could be used as the carbon sources for denitritation. In the present work, most COD was used in the anoxic condition of the SBR to reduce nitrite to nitrogen gas (Fig. 3), reducing the overall nitrogen load and eliminating the inhibitive effect on the subsequent anammox process. Previous studies on biological nitrogen removal from source-separated urine have confirmed that ammonia volatilization and nitrous oxides emission account for less than 5% of the total nitrogen losses during the process (Udert et al. 2003; Burgmann et al. 2011; Macky et al. 2016). Due to the hydrolysis of the urea present in the fresh urine during the storage, ammonium is released to be the major form of nitrogen in the stored urine, meanwhile leading to a rise of pH to around 9.0. In spite of high pH values, the alkalinity in stored urine is the limiting factor for the biological nitrification process, and only sustains about 50% ammonium oxidation by nitrifying bacteria (Udert et al. 2003), resulting in a decrease of pH to 6.5–7.2. Previous studies confirmed that the product of urine nitrification is either an ammonium-nitrate or ammonium-nitrite solution with an approximate 1:1 composition (Udert et al. 2003; Johansson and Hellstrom 1999). In the present work, we obtained an effluent of ammonium-nitrite solution, in similar to the SBR reactor operated by Udert et al. (2003), but the ratio of NO2 −–N:NH4 +–N was 1.24:1. Because the organic matters were used to reduce nitrite to N2 and to achieve around 40% total nitrogen removal, the buffer capacity produced in the denitritation process promoted the ammonium removal efficiency to 75 ± 3% as shown in Fig. 1. The composition of ammonium/nitrite (1:1.24) in SBR effluent is closed to the theoretical stoichiometry, i.e. 1:1.32, of the anammox process (Strous et al. 1998). Granular sludge was formed and higher biomass was retained in the reactor, which significantly supports the growth of AOB and the high ammonium conversion rate of 1.39 kg-N/(m3 d) despite the high organic loading rate of 3.23 kg-COD/(m3 d). Pulse feeding, short settling time and strong shear force have been demonstrated as key factors in promoting the granulation of aerobic activated sludge (Beun et al. 1999; Martins et al. 2003; Qin et al. 2004). In this study, these factors played an important role in developing the discrete compact aggregates. Pulse feeding caused dramatic changes of substrate concentration and pH values in a cycle of SBR operation (Fig. 2), and enhanced substrate penetration into sludge aggregates and substrate storage at the beginning of each cycle. Moreover, heterotrophic bacteria underwent cyclic feast and famine conditions for substrates in SBR operation, which is regarded as a critical approach for granulation owing to the excessive production of extracellular polymeric substances (Tay et al. 2001). Short settling times exerted a hydraulic selection pressure on small flocs of activated sludge, and forced the slow-growing nitrifying communities acclimated in the granular aggregates. The high aeration flow rate (8 L/min) produced a superficial air upflow velocity of 3.68 cm/s and a shear rate of 1200 1/s. This high shear rate contributes to the formation of granular aggregates that resist deformation under physical stress. FISH images indicate Nitrosomonas species were clustered into tight colonies and located in the outer regions of the aggregates, while the total bacteria exhibited a rather homogenous distribution throughout the granular aggregates, which implies a complete penetration of organic matters in the granular sludge (hundreds of μm). On the contrary, AOB were mainly present near the surface (<25 μm), and were surrounded by other bacteria. Song et al. measured the DO concentration profiles in granules performing PN, and showed that oxygen concentration decreased rapidly within 100 μm of the surface under the conditions of bulk DO concentrations of 2.5–7.0 mg/L (Song et al. 2013). Since the DO in our work was much lower (0.3 mg/L), the oxygen penetration region was far shallow. NOB were not detected in the granular aggregates though the granules could retain slow-growing strains from washout. The absence of NOB in the microbial aggregates could partially be explained by the alternating inhibitions of free ammonia (FA, ~140 mg-NH3-N/L) and free nitrous acids (FNA, ~0.15 mg-HNO2-N/L) at the beginning and the end of the aerobic phases, respectively (Anthonisen et al. 1976). These values are much higher than the inhibition thresholds on NOB reported previously. Kim et al. pointed out 0.1–1.0 mg/L of FA will inhibit NOB, while AOB exhibit a much stronger tolerance to FA, withstanding concentrations up to 10–160 mg/L (Kim et al. 2005). Vadivelu et al. (2006) reported that NOB is thoroughly inhibited when concentration of FA and FNA reach 6 and 0.02 mg/L, respectively. Low DO concentration exerts a competitive inhibition by AOB over NOB due to the higher half-saturation coefficient of DO affinity for NOB (Picioreanu et al. 1997). NOB were more severely inhibited under low DO conditions than AOB, which partially account for the absence of NOB in granular activated sludge. Apart from nitrifying organisms, clones related with various potential denitrifiers, such as Pseudomonas spp. Burkholderia and Lactobacillus, were observed. Clones associated with Pseudomonadales, Burkholderiales and Lactobacillales bacteria accounted for more than 70% of the library. In conclusion, 40% of total nitrogen removal could be obtained using the organic matters in stored urine as the electron donors in a SBR performing the partial nitritation and denitrification process. SBR produced an ammonium nitrite solution with a NO2 −–N:NH4 +–N of 1.24 ± 0.13, which is an ideal composition for anammox process. The biodegradable organic matters were effectively removed and their adverse impacts on anammox bacteria were eliminated. Granular sludge was formed in the SBR reactor, and the MLSS concentrations were up to 9.5 g/L. As a result, a high nitritation rate could be achieved under the volumetric loading rates of 3.23 kg-COD/(m3 d) and 1.86 kg N/(m3 d), respectively. Nitrosonomas-like AOB appeared in the outer regions of the granular aggregates, and NOB were not detected. Heterotrophic bacteria were homogeneously distributed in the granules. The microbial diversity analysis with the high throughput sequencing technique shows that Proteobacteria is the predominant phylum, in which Pseudomonas is the most abundant genus. LC, XY, SY and QY designed and worked on the bench as well as drafted manuscript. XT and AW supervised the work and helped prepare the manuscript. JL and DP developed the hypothesis, supervised the whole work and prepared the manuscript. All authors read and approved the final manuscript. The authors gratefully acknowledge the contribution of the anonymous donors of the urine used in this study. The dataset(s) supporting the conclusions of this article is (are) included within the article (and its Additional file 1). This project was partially supported by the National Natural Science Foundation of China (51578042). There is no role of the funding body in the design of the study and collection, analysis, and interpretation of data and in writing the manuscript. 13568_2017_354_MOESM1_ESM.docx Additional file 1. Additional table and figure.